If you’re feeling adventurous, why not plan a project with a colleague! 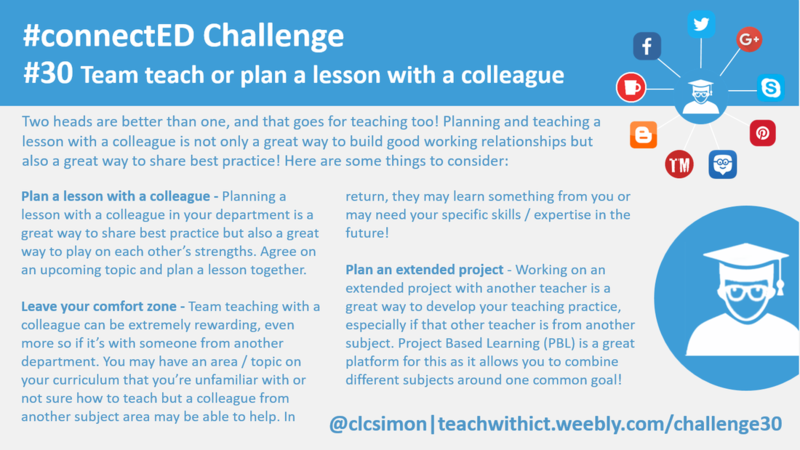 Working on an extended project with another teacher is a great way build positive working relationships, it’s also a great way to develop your teaching practice, especially if that other teacher is from another subject area. Project Based Learning (PBL) is great for this as it allows you to combine different subjects around one common goal! In-fact, many of my favourite classroom management strategies have come from working with colleagues in other departments, in particular, P.E. – you try telling 30 excited kids in the middle of P.E. lesson to stop and look this way!